Could Brookfield Infrastructure Partners LP Be a Millionaire-Maker Stock? The simple answer is yes, but it's how you'll get there that's important with Brookfield Infrastructure Partners. Brookfield Infrastructure Partners LP (NYSE:BIP) offers investors a unique way to invest in a global portfolio of infrastructure assets like toll roads, utilities, midstream pipelines, and seaports. These physical assets are vital pieces of developed and developing economies. With a well-structured approach to investing in the space, Brookfield Infrastructure Partners can easily be a millionaire-maker stock. But you have to understand how the partnership works to understand how it can get you there. Over 100-year-old Canadian asset manager Brookfield Asset Management runs Brookfield Infrastructure Partners. It is part of Brookfield Asset Management's move to more aggressively grow its business by increasing the amount of money it manages, bringing the partnership public in 2008. It is one of the most diversified partnerships associated with Brookfield Asset Management because of the breadth of assets in which it will invest. In fact, it's best to think of Brookfield Infrastructure Partners as a portfolio of assets and not a static business. This is because the partnership actively buys and sells assets over time. Indeed, a key part of management's approach is to buy out-of-favor infrastructure, focus on improving operations, and then sell assets if a desirable price is offered, or assets with higher returns become available for purchase. To put some numbers on that, the partnership has sold 10 businesses for total proceeds of $3.3 billion, generating a cumulative internal rate of return of approximately 25%. That $3.3 billion, meanwhile, has been put right back into the business through the purchase of new assets. In effect, the partnership is trying to self-fund as much of its own growth as possible so it can minimize dilutive unit sales. This isn't the only way in which Brookfield Infrastructure Partners generates cash for future investment. It has a preset approach to distributions, as well, in which unitholder payouts are targeted at around 65% of funds from operations, with 20% for maintenance of its portfolio, and 15% earmarked for growth spending. In other words, Brookfield Asset Management has a systematic approach to keep Brookfield Infrastructure Partners growing over time. One of the key factors to keep in mind with Brookfield Infrastructure Partners is that distributions, at 65% of funds from operations, are going to be a big piece of your return. The yield is currently around 4.7%, well more than twice what you would get from an S&P 500 Index fund. That distribution has been increased every year for 11 consecutive years. The compound annual growth rate of the distribution since 2009, its first full year as a public partnership, has been around 11%. That's more than three times the historical rate of inflation growth. 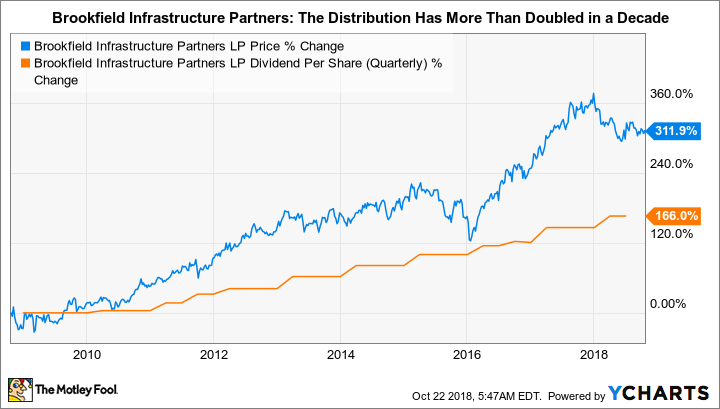 That said, the goal is to grow the distribution between 5% and 9% a year -- clearly Brookfield Infrastructure Partners has been doing a good job when it comes to rewarding investors. The interesting thing right now is that Brookfield Infrastructure Partners' units have fallen by around 10% so far this year. A piece of that is that the partnership's funds from operations run rate in the second quarter was down 4% year over year. That less-than-inspiring result was driven by a number of issues, including exchange rates, a major trucking strike in Brazil, and timing on the redeployment of proceeds from a $1.3 billion asset sale completed in March. This is an opportunity for investors willing to roll with some short-term variation, noting that Brookfield Infrastructure Partners' financial goals aren't meant to be annual targets, but ones that are hit, on average, over the long term. Moreover, as the distribution heads higher over time, so too should the unit price of the partnership. That's exactly what's happened so far, as the price ends up reflecting the ongoing growth of the portfolio as well as the increasing income stream it provides investors. Income investors looking to grow their income stream over time as they seek out millionaire status should take the time for a deep dive into Brookfield Infrastructure Partners, including its recent investment in midstream assets in Canada. Brookfield Infrastructure is not a hot tech stock that will rocket in value, preferring a slow and steady approach that has proven capable of rewarding investors with large and growing distributions backed by an expanding portfolio of vital infrastructure assets. For conservative, income-minded investors, that probably sounds like a really good approach to building a million-dollar nest egg.